It starts with toe tapping… By the second chart, your fingers will likely join your tapping toes. Marc Antoine's recent CD release, My Classical Way on Frazzy Frog Music, draws in the listener irresistibly. He quickly transports you to the warm sensual breezes of his smooth jazz renditions. 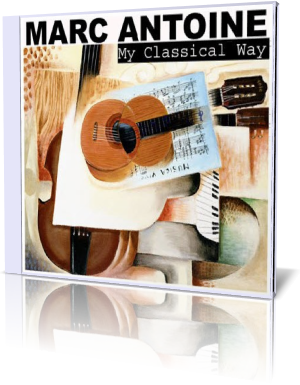 These tracks are familiar melodies of classical heavy hitters like Bach, Debussy, Paganini and Vivaldi. A whimsical and joyful, Paris born Antoine draws heavily on his traditional classical background at Conservatoire de Paris for a solid understanding and delivery of each composer’s intention and personality, deftly translated to the lilting language of 2010 smooth jazz. The unmistakable, sonorous influence of classical guitarist and mentor, Andres Segovia, winds subtly in and out of the charts, particularly through his rendition of Paganini’s Caprice #24. The call and response pattern using the initial phrase of Pachelbel’s Canon in a traditional sounding orchestration allows Antoine to use the “straight” version as a counterpoint for his interpretive creativity. Listen closely as it fades in and out of the background seamlessly and perfectly yet surprisingly timed. If you’re one that tires of a jazz artist who seems to lose sight of the originating melody in an improvisation, Antoine will never disappoint. You’ll never forget what sparked the improvisation, and always enjoy the superbly crafted improvisational journey; a tribute to Antoine’s solid footing in both the classical and jazz genres. Antoine, a prolific writer and arranger with eleven albums in the last twenty years (Classical Soul -1994, Urban Gypsy -1995, Madrid -1998, Universal Language -2000, Cruisin’ -2001, The Very Best of Marc Antoine -2002, Mediterraneo -2003, Modern Times -2005, Hi-Lo Split -2007, and ForeignXchange -2009) and a bevy of chart toppers, #1 R&B hits and jazz awards, weaves a satisfying meal in My Classical Way. Try a fresh appetizer of Carmen B from Georges Bizet’s opera, Carmen, to whet your appetite with that tantalizing chromatic descent so immediately identifiable in this classic. Listening for each new twist and turn, Antoine has in store is a large part of the fun of a first time exposure to this album. Afterward, knowing that inspired classical-jazz fusion riff is coming up on repeat plays are almost as much fun. Antoine knows innately how to blend the subsequent substantive main entrée versions of Mozart’s Symphony #40 in Wolfgang 40, Chopin’s Opus #23 in his Opus chart and Antoine’s revisit to Vivaldi’s Four Seasons in Rebirth, with palate cleansing, Segovia-spiced Air on Madrid from Bach’s uber-recognizable Air on a G String. Save room for a sweet but not saccharine dessert of Maria’s Song a la Gounod’s Ave Maria. Tuned into pleasing yet surprising his loyal fans, Antoine reflects, "I'm always looking to try new things, different approaches, while keeping in mind those who have enjoyed the music I have created up till now. Looking back, it's all happened so quickly, but it's great to realize that I've had the opportunity to share my music with thousands of fans throughout the world. My Classical Way brings me full circle and it's wonderful to finally share this part of my musical heart and upbringing with everyone." When the last riff fades away, you’ll beg for more. Or just select a permanent loop for a drug-free mood lifter, even on the darkest rainy day. Catch a Marc Antoine signing at J and R Music World in New York City at 12:30 on October 19th, at the American Smooth Jazz Awards in Chicago at the DuSable Musuem on October 29th, or if you’re really lucky, you’ll be aboard the Groove Smooth Jazz Cruise leaving Port Canaveral, FL to the Bahamas from November 5th – 8th ! The consummate entertainer, Marc Antoine, always knows how to satisfy the audience with his robust energy and tremendous talent. These classical pieces can be enjoyed with a bottle or two of fine red wine savored all night long. You can distinctly hear joy in each piece. Encore!